It’s Christmastime in Tokyo, and sirens are blaring. Men, women, and children put aside work, school, shopping, and the many distractions that life in modern Japan offers. They move quickly, but calmly to the nearest emergency shelters, for they know only too well what these klaxons mean. Soon the air will be filled with the smell of freshly baked dough, cinnamon, and nutmeg—the kaiju are coming! 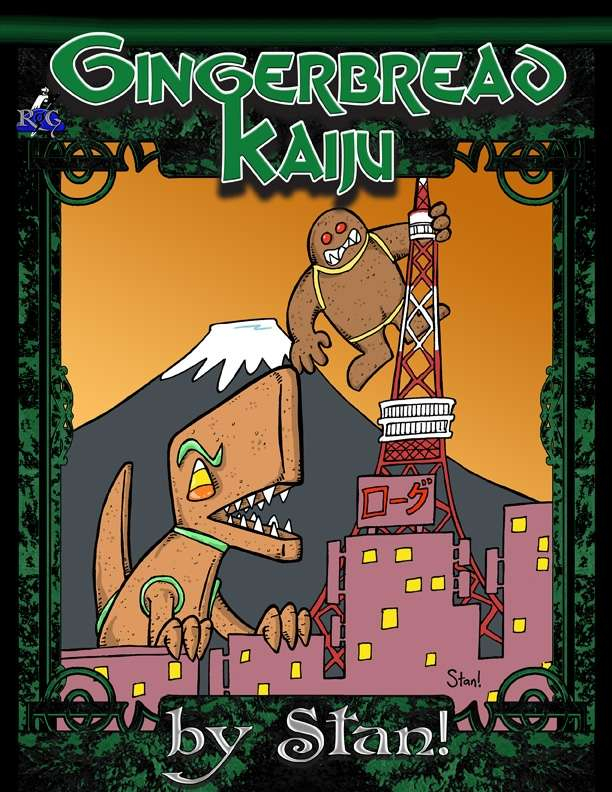 Gingerbread Kaiju is a none-too-serious board game where each player takes on the role of a kaiju—a giant monster of incredible destructive force—that happens to be made entirely of gingerbread. As anyone who has seen a Godzilla or Gamera movie will tell you, kaiju do not generally get along very well . . . and they ALL hate Tokyo! In this game, your kaiju will smash up the city to gather power, then unleash this confectionary wrath on the other monsters in hopes of destroying them all and being crowned the King of the Kaiju! anyway to also get it in print? Not at this time. Since it's 13 pages long, we thought having interested folks print it from their printer was more economical than paying for a print version. That said we are considering an updated, expanded version in the next couple of years, which we hope to have print options for. This title was added to our catalog on December 09, 2013.